Slush Pro is a Genesis child theme created by third-party Genesis developer ZigzagPress. It’s a multipurpose theme that uses a sleek, chic and elegantly minimalist design. Its primary layout is designed for professional blogs and even magazines, but it can also be used to build simple online stores and stunning portfolios. Widget Areas – 10 widget areas are available for you to customize to your liking. Custom Page Templates – This theme comes with four pre-designed page templates you can use, which are labeled Default, Masonry, Archives and Blog. Customizable Header – Upload your own logo, or set up a quick, text-based logo. Theme Customizer – Tweak this theme’s design to your liking with the expansive amount of settings available in the live theme customizer. Theme Options – A lot of options are also available in the backend of WordPress, giving you even more ways to customize this theme. Layout Options – Choose from post and page layouts that have left sidebars, right sidebars or no sidebars. When you download Slush Pro from StudioPress, you’re given two ZIP folders. Install Genesis through the WordPress theme uploader first, then install Slush Pro. You can also extract the folders and upload them via FTP. Activate Slush Pro once it installs. These settings allow you to customize several items that affect your entire site. The Default Layout section, for starters, allows you to select the main layout you want your pages to have while the Header section allows you to choose between a Dynamic Text Logo or an Image Logo. There are also several sections that allow you to customize settings for your content. The Comments and Trackbacks settings, for instance, allow you to select whether or not comments and trackbacks appear on all of your posts and pages. This is in contrast to the setting you can select on individual posts and pages. You can also choose the way blog posts are displayed on archive pages as well as which categories display on your Blog page and how many posts appear on it. The SEO settings allow you to change a variety of different settings that can affect whether or not your site ranks well in search engines. For example, many SEOs recommend not indexing archive pages, and this theme applies no-index to archives by default. Let’s move onto the live theme customizer. Let’s start with menus. This theme comes with two menus, which are a primary menu that displays beneath the logo and a secondary menu that displays above the logo. You can even select how these three elements (primary menu, secondary menu and logo) display when you open the Site Layout section. You can adjust several style settings in the Body Style, Heading Style, Accent Colors and Footer Settings sections. The Body Style and Heading Style sections deal with fonts, particularly the font families, weights and styles your body and headings 1-6 use. You can even choose the sizes and colors these elements use, though you can’t choose individual colors for each heading, unfortunately. The Accent Colors section has one setting that allows you to choose the color of certain elements, such as the color that displays when you over over the Dynamic Text logo. You can also change the labels your blog uses for specific elements. You can see how these widget areas, particularly the Home Widget, allow you to use this theme in a variety of different ways, including building an expansive homepage displaying your latest and greatest posts from different categories. This theme also comes with a custom post type you can use to create and manage your portfolio with individual entries and categories. You can even control how your site links to each individual portfolio item. Speaking of entries, let’s go over the settings you can configure on the WordPress post and page editors. The settings you can configure for individual posts and pages include SEO settings, layout settings and even custom scripts. 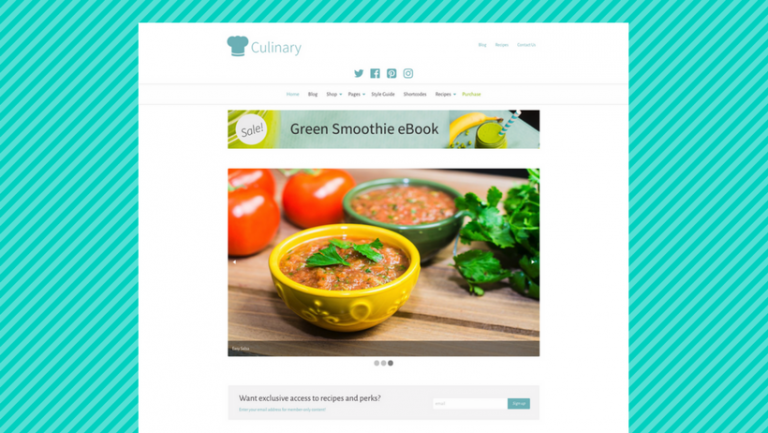 The only page template that has different settings is the Masonry page template, which allows you to display blog posts and portfolio entries in a masonry grid and control how many columns it uses and which categories it displays. Slush Pro is a fine Genesis child theme that does what it sets out to do, which is to give you a sleek and an elegant way to build a blog, magazine site, portfolio or online store. It’s really easy to customize, and it even has a few settings developers can get on board with, namely the header and footer script editors. There aren’t many downsides to using this theme, except for a few minor inconveniences here and there, such as no built-in feature that allows you to hide page titles and no built-in way to customize colors for individual headers. Slush Pro can be purchased bundled with the Genesis framework for $129.95 at StudioPress if you’re interested in it. Use the links below to check it out.